Of the approximately 25,000 bridges in Iowa, 28% are classified as structurally deficient, functionally obsolete, or both. The state of Iowa thus follows the national trend of an aging infrastructure in dire need of repair or replacement with a relatively limited funding base. Therefore, there is a need to develop new materials with properties that may lead to longer life spans and reduced life-cycle costs. In addition, new methods for determining the condition of structures are needed to monitor the structures effectively and identify when the useful life of the structure has expired or other maintenance is needed. High-performance steel (HPS) has emerged as a material with enhanced weldability, weathering capabilities, and fracture toughness compared to conventional structural steels. In 2004, the Iowa Department of Transportation opened Iowa?s first HPS girder bridge, the East 12th Street Bridge over I-235 in Des Moines, IA. The objective of this project was to evaluate HPS as a viable option for use in Iowa bridges with a continuous structural health monitoring (SHM) system. The scope of the project included documenting the construction of the East 12th Street Bridge and concurrently developing a remote, continuous SHM system using fiber-optic sensing technology to evaluate the structural performance of the bridge. 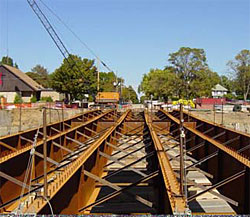 The SHM system included bridge evaluation parameters, similar to design parameters used by bridge engineers, for evaluating the structure. Through the successful completion of this project, a baseline of bridge performance was established that can be used for continued long-term monitoring of the structure. In general, the structural performance of the HPS bridge exceeded the design parameters and is performing well. Although some problems were encountered with the SHM system, the system functions well and recommendations for improving the system have been made.